Yellowstone National Park is the crown jewel of the National Park System. It is also a fly fishers dream trip. So when my friend Jeremy Van Dessel told me that he was heading out to Yellowstone this summer and wanted some some fly fishing tips I was excited. Jeremy is a real good fisherman who has fished all around New Hampshire and Maine. Jeremy is what is called in the fishing world a Spincaster, or Baitcaster. This is because he uses a spinning rod and reel. In Spin Casting, the line has a lure or small weight on the end that carries the line out into the water. 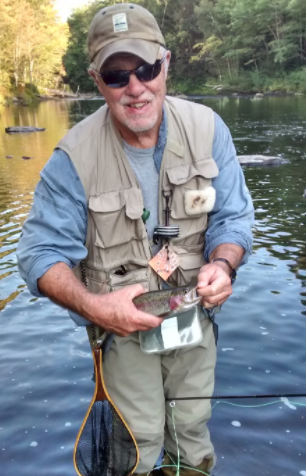 In fly fishing it is the line that delivers the fly into the water. So there is a little bit of a learning curve making the transition when you first begin to learn. 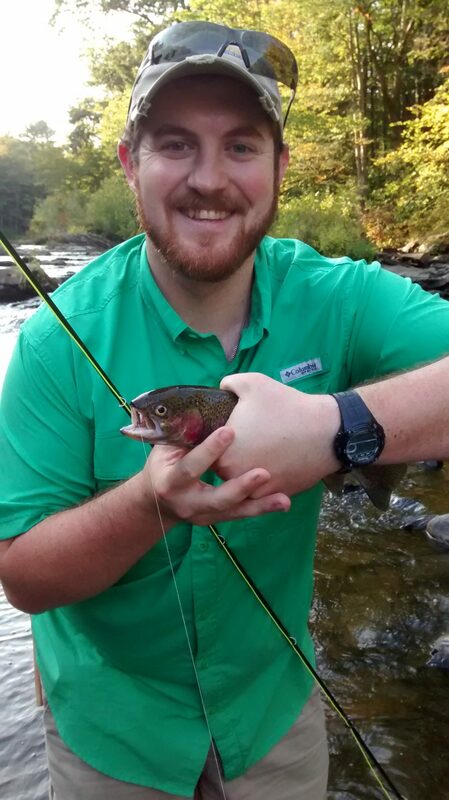 I had taken Jeremy out last fall for the first time to fly fish. He had a nice fly rod that his dad had given to him which he hadn’t ever used. It was a beautiful fall day when Jeremy arrived at my house. He had brought his fly rod and reel as well as his Spin Casting rod. Jeremy also brought his tackle box with all his lures and tackle and other paraphernalia. The tackle box was large. It has been about ten years since I have fly fished only, and I had forgotten how much equipment I used to carry around. As we headed to the water I preached patience. I mentioned that I didn’t catch a fish my first ten times out. So I showed Jeremy the basics and let him practice for awhile on his own as I wet some line and shouted encouragement from a distance. After awhile he wanted the “River Runs Through” experience and he started to gradually lay out some line. So I let him continue to practice his casting. We had been out about an hour and a half when I heard “I got one.” To my surprise I see a fish dancing on top of the water. Urging him to keep the tip of the rod up, I was grabbing for my net and stumbling on the rocks trying to reach the fish before it threw the hook. I didn’t want to lose Jeremy’s first trout on the fly. So with a lunge and a swoop I netted the fish. A celebration ensued, mostly by me. A few quick pics later and we released the fish. So as Jeremy and I head out for more practice this spring, getting him ready for Yellowstone this summer, my mind will be dreaming about fly fishing Yellowstone as I fish my local rivers.